The Asiana Business Class Lounge wasn’t anything special – it’s a whole hell of a lot better than the Star Alliance lounges in Frankfort that’s for sure. The food in the lounge was limited and the wait for the showers was surprisingly long (we waited nearly 90 minutes for the showers to open up) – although it was “rush hour” at Incheon. We headed over to the gate around 10h15 as I wanted to get settled and get a glass of champagne while everyone else got settled in. This Asiana 777-200 was equipped with their newer Business Class Seat – which has the unfortunate name of “Quadra Smartium” – no idea how they came up with that name. I did really dig the seats. The cabin was in a 2-2-2 configuration in 5 rows with the 6th row having only the two center seats (the cabin has 22 total seats). We took the center section in row 4, so we’d both have easy access to the aisle. The business class cabin was about 75% full and we consistently had 3 flight attendants working our cabin – we’d see others come up from coach from time to time and ours would head to the back and help out as well. While there was an odd movement between the cabins, service wasn’t lacking at all. 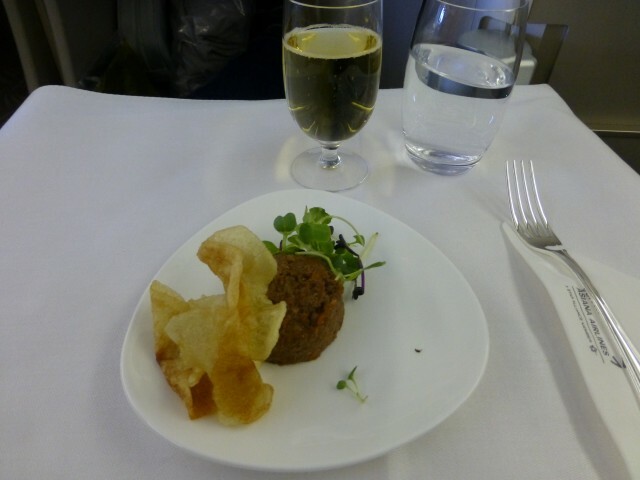 As I was getting settled into my seat, a very prim and proper stew took order for a pre-departure glass of champagne. 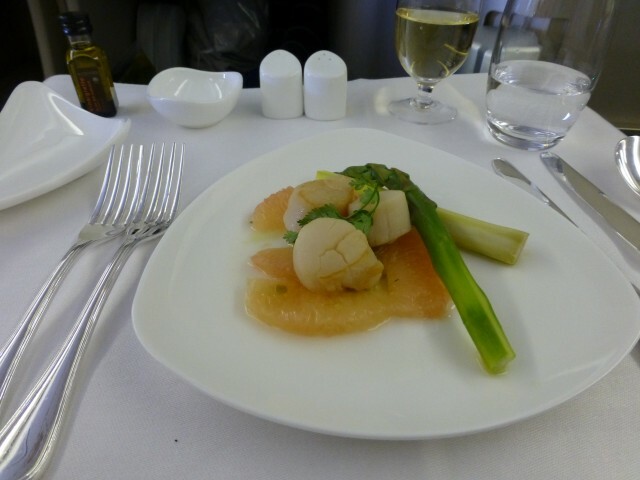 Asiana was serving the 2004 De Venoge Champagne Blanc de Blancs. This wine was perfectly fine – I liked the 2003 Dom on Thai better, but this selection was substantially better than we received on the other flights (including Lufthansa Business). Menus were then distributed and before the doors closed and we pushed back, I had finished two glasses of this wine. I don’t have a lot of experience eating Korean food, but I was really looking forward to Asiana’s Bibimbap – but unfortunately it wasn’t even an option on this flight, which was quite disappointing to me. 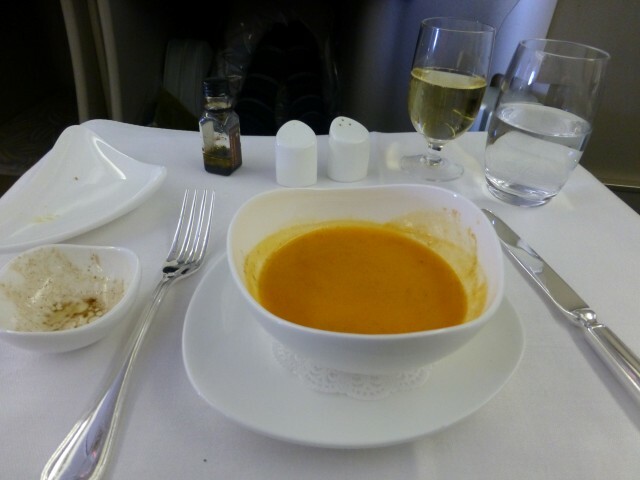 I chose the Western Lunch and continued to pair the various courses with the champagne. While the lunch wasn’t at all what I was expecting (and to this day I still haven’t had a traditional Korean Bibimbap) it was actually quite good. I usually don’t have good luck with red meat on planes — over cooked and under flavored beef isn’t high on my list — but Asiana did a really nice job on the meal preparation. The service was pretty well executed as well. Before the safety video, all the stews did a welcome bow in perfect unison. They all looked almost exactly the same (height, weight, hairstyle, etc) and each one (that I interacted with) performed her job exactly as her colleagues did. Yes, I said she — I didn’t see a single male flight attendant on this plane. How was the hard product, you ask? The seat was comfortable and the IFE had enough movies/TV shows to keep me entertained. I mostly just watched old James Bond films and slept, when I wasn’t eating. Speaking of sleeping, these seats are billed as angle flat seats, which I don’t get. The seats are fully flat. I slept quite a bit on this flight — even at home in bed I wake up 2 – 3 times over an 8 hour period. On board I slept a total of 6.5 hours and I woke up 2-3 times . The seat, when turned into a bed, was definitely a narrow seat, although I didn’t feel claustrophobic, it was just tight when trying to roll over, etc. I woke up for the final time shortly before breakfast and asked for a glass of champagne (shocker, I know) and was informed they were completely out. Such a catastrophe for me. I survived. We arrived a bit earlier than scheduled and were some of the first off the plane – as everyone exited through door 1L. When we hit Customs and Border Patrol we were the only ones there. MS headed through the traditional immigration line and I headed over to the Global Entry Kiosk. I had received my Global Entry clearance just a few days before our trip. MS beat me to baggage claim for two reasons: 1) He was the only one in line at that point and 2) I hadn’t used the kiosk before so I actually had t read the questions. In a matter of minutes our luggage was coming out and we were on our way to a cab on this Easter morning. 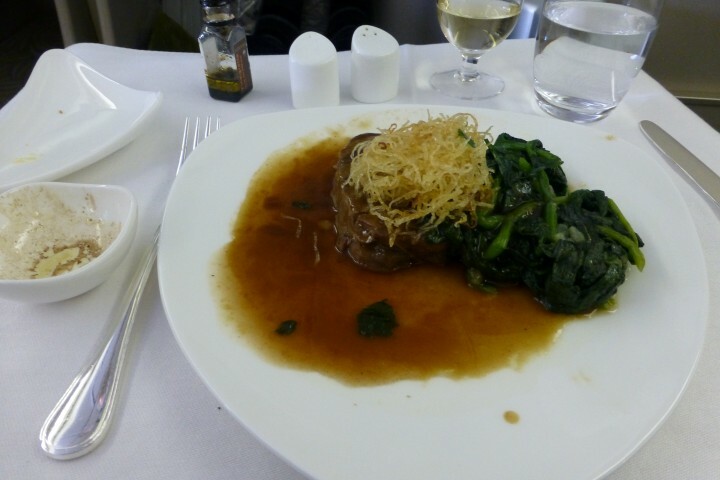 Have you flown Asiana’s Quadra Smatium Business Class before? What did you think of the seats? Did you run out of champagne on your flight? Have you tried Asiana’s or Korean Air’s bibimbap? By Tim in Travel on March 2, 2014 .